Our TreeSafe team specializes in large, hazardous removal and tree preservation. By utilizing specialized heavy equipment and technical climbing techniques -- we offer various methods of safely executing removals, while ensuring protection to your home. Our goal is to provide a seamless process from start to finish. Click on any of the services below to learn more about how we can help with your tree needs. Are you TreeSafe? Though majestic, our trees often pose hazard to our property and lives. Whatever your reason for removal, our knowledgeable team is equipped to skillfully execute the removal of even the most precarious of trees. Contact Us today for a free estimate and learn how our team of tree professionals can meet your removal needs. We provide a variety of options from start to clean-up that are tailored to suit your needs and budget. With our 90' Tracked Aerial Lift, our team can go where others can't. It's compact exterior and spider-like maneuverability enable it to go where many machines cannot. 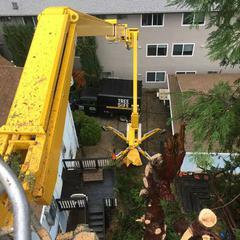 From steep terrain to tight squeezes - we are able to reach trees for safe trimming and removal in a productive and efficient manner. Take a look at our Aerial Advantage page to learn more! We have various means for safe removal. Aside from climbing, we also utilize crane, stump-grinding and logging services as a part of the removal process -- dependent on the demands of each unique job. Click HERE to watch a crane assisted tree removal in action! Often, a crane is needed to safely lift and carry away large pieces of wood in order to protect your home or property. Every scenario requires a different approach -- our estimators will go over options and let you know if a crane is needed. We strive for a low-impact removal process, taking great care in respecting our surroundings. Our skilled tree removal technicians work to ensure the protection of what's below, keeping the understory intact. By practicing special techniques such as zip-lining and negative rigging, we are able to provide a more cost-effective service and leave a lighter footprint. Click HERE to watch a video of zip-ling and see how we were able to move the material to the far distant clean-up area. With time and age, trees need proper guidance and care. When safety pruning a tree, we only utilize roping and rigging techniques. Never using gaffs (also known as "spikes") that can be damaging to the cambium layer of tree and make way for insects to enter. We recommend routine maintenace as needed over the years, in order to best promote optimal healthy growth and maintain a safe structure. By lightening the load through selective tip reduciton, we can significantly reduce the odds of a tree toppling over in a storm. As trees, especially Oaks, draw moisture up to their leaves, making them top-heavy and more succeptable to failure. When the weight is distributed properly, the tree can thrive and last for years to come. By safety pruning, we also remove any deadwood that can pose a great hazard to those below. Removing any widowmakers, deceased or decaying pieces will allow the tree to focus on growth rather than on healing. Through the trees an unseen world awaits. By selectively pruning or thinning unnecessary lowlying foliage, we can open a whole new vantage point for you to enjoy! Whether you are on the lake, river or seeking a more expansive view -- view enhancement can give you the dramatic change you are looking for. It is a quick and efficient way to add to property value and impact your surroundings. Tree support systems are used to provide supplemental support to leaders and individual branches by limiting movement. When a tree has a structural defect or condition that poses high risk of failure, which may result in injury or peroperty damage, a supplemental support system can sometimes reduce the risk. Be sure to familiarize yourself with the ISA's best management practices. TreeSafe uses a specialized high strength fiber-type cable as an alternative to steel cable. It is easy to splice and easily adjusted in the field. It is a brown color so it will better blend in with the environment. It is also adjustable over the years as the tree continues to grow. We use special chafe sleeves to avoid abrasion and damage to the cambium layer. Distinguished easily by dying tips - a late sign of infestation, indicates the tree has lost the battle to Bark Beetle and should be safely removed. A healthy tree will generate an abundance of sap in order to defend against this harboring pest; though far to often it is too late. The adult beetle carries a fungus which blocks the inner bark from the sapwood causing the tree to die out. In wake of the drought, trees have been severely weakened and left even more vulnerable to an attack. Woodpeckers aid in damage by removing outer bark to feed on larvae. Once one tree has reached it's demise, surrounding trees quickly fall victim. This is when eradication comes in, to further promote protection to healthy, neighboring trees. It is recommended to first professionally diagnose that the trees are indeed plagues with Bark Beetle. Once diagnosed, a plan of action can be put into place. We highly encourage that the infested trees be removed and fully disposed of as promptly as possible. 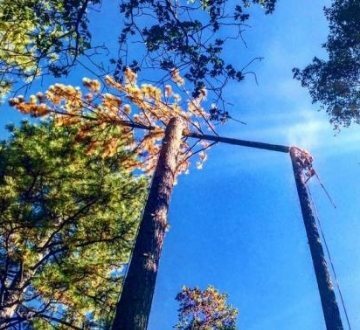 The longer the dying trees stand, the more dangerous they become to remove -- not only does this promote further spread, but impacts cost efficiency. Due to the inherent danger of removing a decaying tree verses a more sturdy tree, risk is significantly increased and options of removal methods become increasingly limited. Looking for an assessment or an arborist report? Fill out the form below or give us a call at 530.470.0996 to set up a time for our long-standing team member and ISA Certified Arborist, Nicholas Ford (#WE-11435A) to come out and provide you with a consultation or report. The consultation fee can be later applied as a discount to the total of completed services when all recommend work is performed. Arborist assessment and consultation; The cost for the Arborist Report is a flat fee of $125.00 for the report itself, in addition to a port-to-port charge $60.00 per hour. Fill out the form below to request arborist services. ​To learn more on ISA certification and qualifications, please visit the International Society of Arboriculture's website. When the power of mother nature calls, think TreeSafe. Often times, trees can be unpredictable -- posing a very real and immanent threat to our property and lives. If you are facing an immediate tree hazard, or experience any of the following, please try to give our emergency line a call -- 24 hours a day, 7 days a week at 530.613.1015 -- Availability is not guaranteed. Our team has many methods for rigging or using heavy equipment to safely bring down hazard trees. Often times, we may use surrounding trees to climb and lower one piece at a time with precision. Other times, we may contract a crane. Our goal is to bring you peace of mind while mitigating the hazard. Remember, prevention is best. It is always most cost efficient to eliminate potential hazards before it is too late. We provide Arborist Reports/Assessments, click HERE to learn more. *Please Note: Our Emergency rate is: $150/per man/per hour, port to port -- with a $900.00 minimum. On average emergency work is performed with a 3 or 4 man crew, additional costs such as crane/tractor charges are additional. his is primarily due to the extreme liability and risk posed to our team members. As well as factoring around-the-clock operating costs. Once the immediate hazard is mitigated, we are often able to come back at a later time to tackle clean-up at a lesser rate. Our team is comprised of percision tree fellers, technical climbers, an ISA Certified Arborist and Certified Heavy Equipment Operator as well as roping and rigging masters -- we've got the tools and skills it takes to get the job done right. TreeSafe provides both residential and commercial removal services. We proudly serve Nevada and Placer counties as well as some outlying areas in Sacramento and El Dorado counties. Visit our About Us section to learn more about what makes us qualified to service all of your removal needs.